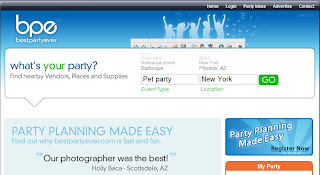 BestPartyEver is an online party planner that helps people plan events and parties. It has online party planning tools that include customizable To-do lists, Guest lists, Budget Calculator, and allows editing of Event Details like time and date. It also offers a special search engine for you search vendors which closed to your party place, that makes you easy to buy something for your party.